Fabinho has explained how he got through two matches in central defence this January. Against Wolves in the FA Cup, Jurgen Klopp felt the need to rest Virgil van Dijk, so deployed the Brazilian alongside Dejan Lovren. But when the Croat left the field injured after six minutes, 16-year-old Ki-Jana Hoever came on and played next to Fabinho in a 2-1 defeat. 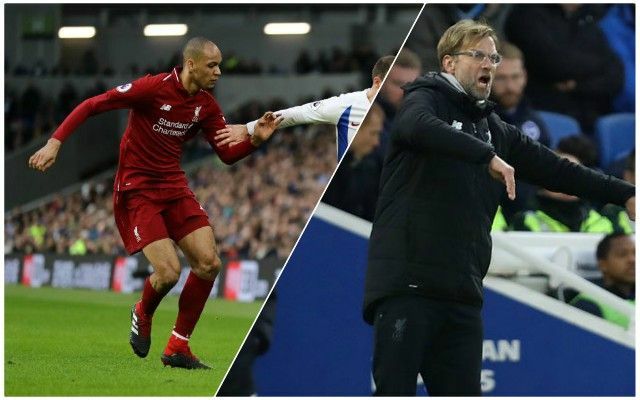 Then in our far more important Premier League fixture with Brighton, van Dijk was recalled to marshall the backline with Fabinho next to him, with Klopp ruling Joel Matip not yet ready, with Joe Gomez still a fortnight away from returning. The summer signing didn’t put a foot wrong in either fixture, in fairness, which is extremely admirable considering it’s such an unfamiliar position. “I think it went well, I had a good understanding with Ki-Jana Hoever, the communication was good. Regarding positioning, I improved throughout the game in this aspect. I did well. Despite Fabinho doing well, we want him back in central midfield. Matip is fit to face Crystal Palace and should start alongside van Dijk at Anfield this Saturday. We think with Gini Wijnaldum struggling with a knee problem, Klopp will pick Fab next Jordan Henderson in a double pivot, with Xherdan Shaqiri, Roberto Firmino, Sadio Mane and Mo Salah ahead of them. Against Roy Hodgson’s side, we’d hope to win – and ideally win well – considering Manchester City’s goal difference has crept above ours now.